"Ace in the Hole" (L.) and "Five-Star Final" (R.), part of The Newspaper Picture fest at Film Forum. As an institution, the newspaper may be on its last, feeble little legs, but when it finally croaks, we’ll always have the celluloid canon known as the Newspaper Picture--which they’re fêting at Film Forum starting today with screenings of 40+ classics in the genre, running through May 6. 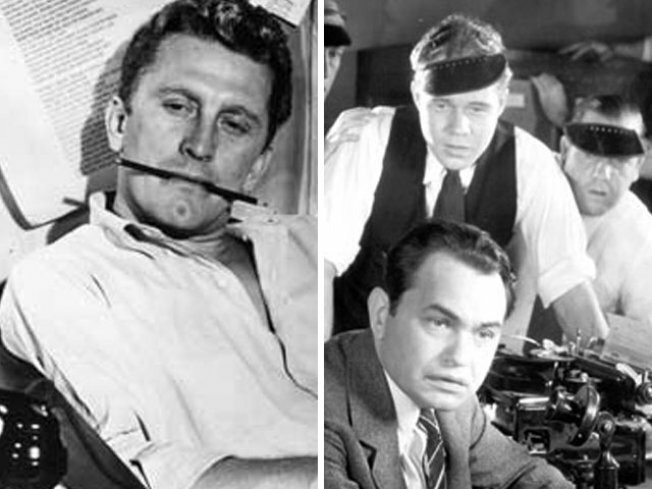 From the biting noir of “The Sweet Smell of Success” to the screwball banter of “His Gal Friday” to the tense topple-the-royalty action of “All The President’s Men,” these films mine a newsroom backdrop for tension, tone or laughs, and serve up a whole buffet of fun tropes: the lady-reporter with sass and gumption, the rogue newsman who grabs his trenchcoat and yells “I gotta get the story!” over his shoulder. Will they meet their deadline? Will they get the witness to talk? And why is everyone wearing those funny little visors? Plus all the thrills of fingers whacking away on enormous, cacophonous typewriters, which were just like computers, but with no copy-and-paste function. Last night, Film Forum kicked The Newspaper Picture with 1951’s Billy Wilder film “Ace in the Hole,” starring Kirk Douglas as a ruthless reporter exploiting a doomed man trapped in a cave-in. (Choice quote: “I can do big news, small news, and if there’s no news, I’ll go out and bite a dog!”) Brooke Gladstone, co-host of NPR's On the Media, will introduce the 7:40 show.